Mass Anabolic Kit RD - 3 X 60 Tablets Complete Pro Anabolic Muscle Building Stack. The Anabolic Pro Kit RD in the latest nano-technology will give you better strength and size gains. Click here for the newest generation of products and the latest scientific discoveries and possibilities. The efficient combination of three carefully matched products DecaVol RD, 4-AD and Arom-X ensures a safe and free of side effects muscle within the shortest possible time. For maximum muscle growth is the strongest 1-androsterone, testosterone designer RD. Ensures the maximum impact strongly anabolic component of 4-AD RD. Coupled with the estrogen and testosterone control management product Arom-X RD which is used to settle a combination results with maximum effect. If DecaVol, 4-AD and Arom-X are combined - a rare hormonal synergy occurs, is often not by any other pro anabolic compounds on the market today, twice! DecaVol RD may be the most effective and side effect free, muscles harder and efficient joint lubricator. 4-AD is an explosive accelerator size, which also increased libido and general well-being. If these unique connections are moved together, they take their own lives. 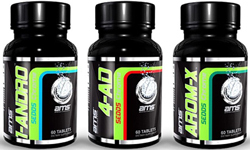 Users can often expect deep and tight profits, increased Gym endurance, vascularity and cognitive Rush push heavy weight by multiple reps, if you have completed this unique cycle Arom-X include and indispensable for the benefit of the body's regulation of estrogen and helps natural testosterone level of the conclusion of the final cycle to recover. DecaVol RD is 240% more anabolic than testosterone, has an excellent effect on mass building - strength gains and fat loss. DecaVol RD can absolutely safe since no unwanted conversion to estrogen or DHT! The new converts to nandrolone DecaVol RD ("DECA"), the material of choice worldwide for many bodybuilders. The most efficient products, when combined make sense. Due to the tremendous versatility DecaVol RD is used as a base product for muscle building and fat loss cycles. DecaVol RD enhances the effects of other products in addition to and is therefore perfect for combining with other products. DECA, also known as 19-nor-testosterone or nandrolone (Deca Durabolin), is the material of choice worldwide for many bodybuilders, because it is undisputed and has a very low androgenic anabolic activity. This gives DECA in bodybuilding circles a high level of popularity. DecaVol RD remains active in the body very long and the effect is therefore very long lasting, sustainable and efficient. 4-AD RD is the 4-androstenediol the next generation. 4-AD RD ensures exceptional build muscle mass and strength increases significantly. 4-androstenediol is not for nothing that one of the most popular muscle building products of all Zeiten.Der muscle mass and strength gains come at the 4-AD together with a marked increase in libido. 4-AD promotes training and helps to feel like the general feeling of good training as it is known when taking testosterone. RD 4-AD converts to testosterone through the natural, the body occurring enzyme 3beta-HSD. Due to the higher conversion rate of 4-androstenediol as compared to the previously available 4-androstenedione 4-AD RD is the most effective testosterone products ever. Arom-X RD is one of the strongest anti-estrogen and testosterone products on the management Markt.Arom X RD prevents the production of aromatase enzymes that are responsible for the formation of estrogen. Thus Arom X RD ensures that estrogen in the body can not only be produced. This results in an increased testosterone production, increase libido, and the prevention of estrogen-related side effects. Arom-X RD™ contains three powerful and unique ingredients, which have been shown in scientific literature to effect estrogen production. Other Ingredients: Natural & Artificial Flavors, Natural Peppermint Flavor. Suggested Use: DecaVol RD Take 2 Tablets per day orally, Use in divided doses 8 hours apart. dissolve 1 RD Tablet under the tongue. then swallow. Suggested Use: 4-AD RD Take 2 Tablets per day orally, Use in divided doses 8 hours apart. dissolve 1 RD Tablet under the tongue. then swallow. Suggested Use: Arom-X RD Take 2 Tablets per day orally, Use in divided doses 8 hours apart. dissolve 1 RD Tablet under the tongue. then swallow.